For the month of February, the International Food Challenge was Bordeaux cuisine. The recipes were given by Saraswathi. Bordeaux is the port city on River Garonne in the south west region of France. It is famous for its wine as it sits in the wine region of France. Bordeaux is famous for shopping, wining and dining. We had a choice of French vanilla and rum cakes, Bordeaux cookies or Mesclun salad. Since I have baked a lot for the past two months I decided on making the salad. What is mesclun? Mesclun comes from the Provençal word mescla (to mix) which literally means mixture. Mesclun is a mixture of young spring time edible leaves. The mixture can have arugula, spinach, endive, chervil, mustard greens, swiss chard, mache, lettuces and sometimes added with edible flowers like nasturtiums,dandelions or rose petals.These young leaves add a flavorful taste to the preparation. Goat cheese, other salad vegetables, dried fruits,onions, shallots etc are added to make a wholesome salad. What you want to add depends on you. Though I didn’t get proper mesclun, I mixed spinach, arugula, looseleaf lettuce and iceberg lettuce.You can use any mixture of the greens you prefer.The combination of three fruits with onion and nuts was heavenly. I know many people frown when fruit is added to a salad, but I love fruit in my salads. Do you love adding a variety of fruits to your salad? Wash the salad leaves. Pat it dry on a kitchen towel. Roast almonds lightly on a pan. Chop the almonds into slivers. Cut the onion into thin slices or dice it finely. Prepare the dressing by whisking the ingredients together. 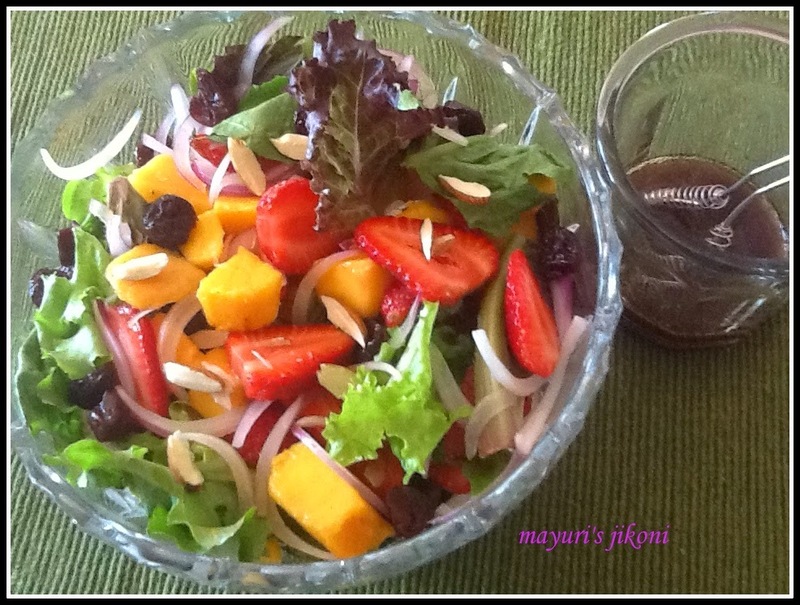 Put the salad leaves, strawberries, mango, cranberries, chopped nuts and onion in a bowl. Add the dressing, mix or toss and serve. Perfect light lunch. Colors are amazing. It definitely is and delicious too. Didn't want to sleep with a heavy tummy so had it for dinner.